The sweet heavenly scent of stargazer lilies mixed with pink roses and alstroemeria makes this large bouquet a customer favorite. A graceful arrangement suitable for every occasion. Measures approximately 28" H x 23" W (as shown) and is hand delivered in a clear glass vase. Spectacular! Star Gazer Bouquet is a hand delivered gift. These gifts are delivered by one of our local design centers located throughout the United States and Canada. Same day delivery is available for most gifts when ordered before the cutoff time. 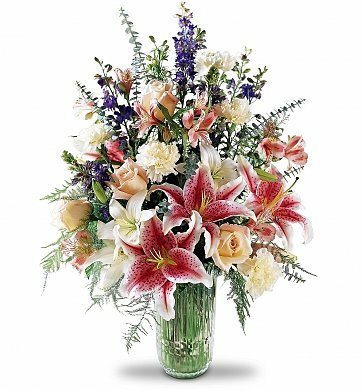 The cutoff time for Star Gazer Bouquet is 2 PM in the recipient's time zone. My sister in law loved the Bouquet. We ordered from Australia and had it delivered in Tampa. She send us a picture and it was much the same as in the picture in size, flowers etc. Pleasantly surprised!!!!! Will definitely use the service again. I did not see the flowers but the recipients said they were absolutely beautiful. We sent this to a co-worker and she had nothing but praise for the beautiful arrangement - fresh and lovely! thank you! The bouquet was delivered in time and looked pretty much like in the picture. I am completely satisfied.